This Bad Hair Day Mood Monkey plush animals wants to know... "Who are you?" Let your mood and personality ring loud and clear... Bad Hair Day! Don't fret too long about a bad hair day... let this Mood Monkey and a fashionable hoodie save the day! 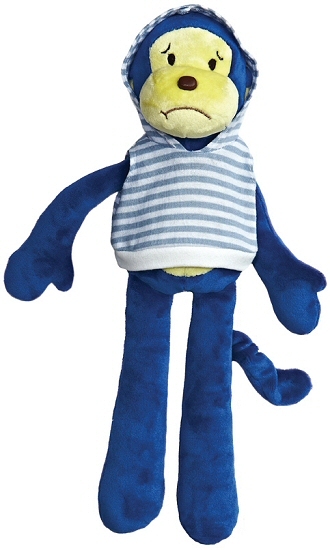 With an adorable blue and white striped hoodie, this Bad Hair Day Mood Monkey has soft blue fur, yellow accents, and embroidered eyes and mouth. Mood Monkeys are fun and personable stuffed monkeys with diverse, unique, and sassy personalities that are wonderful for helping you express who you are, even if that changes from day to day. With a big red shiny heart in her hands, this Boy Crazy Mood Monkey has soft hot pink fur with fun embroidered eyes and lopsided smile. Monkeys are totally cute and this little CHARM IT! monkey charm has lots of love to share!